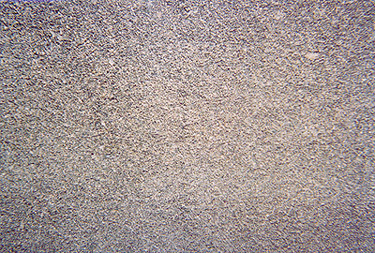 A close shot of gravel that's locked in the tar after the loose rock is swept away. 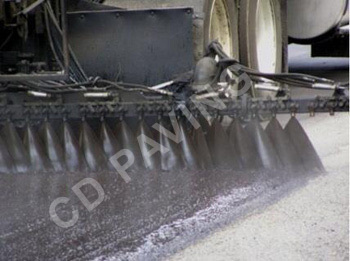 What is Tar & Chip Seal? 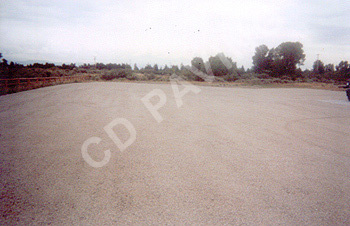 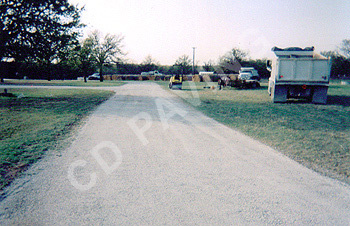 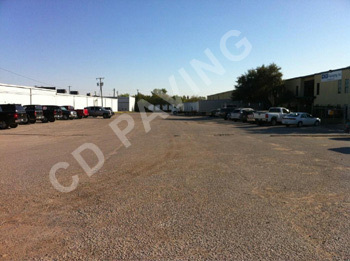 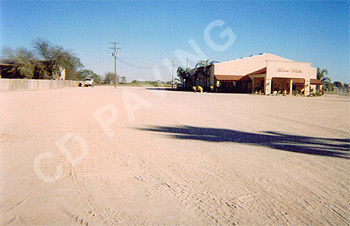 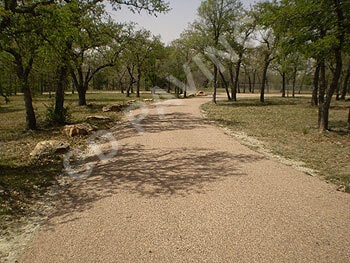 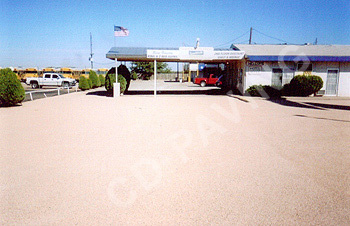 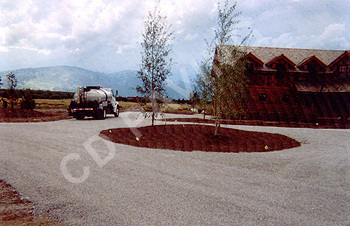 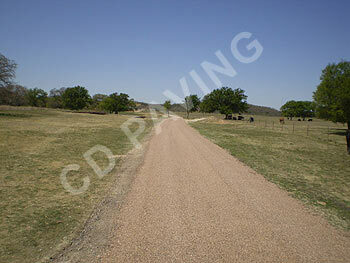 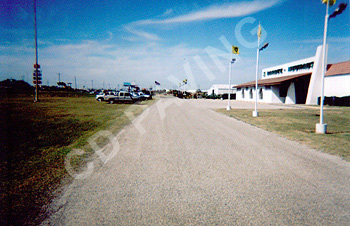 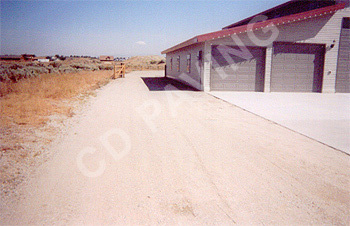 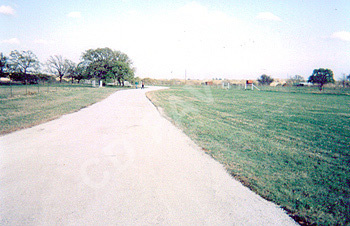 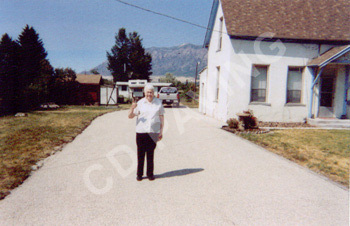 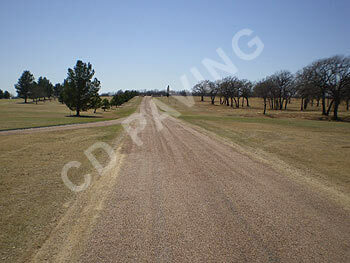 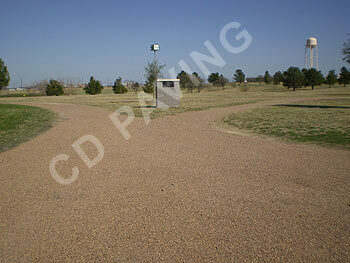 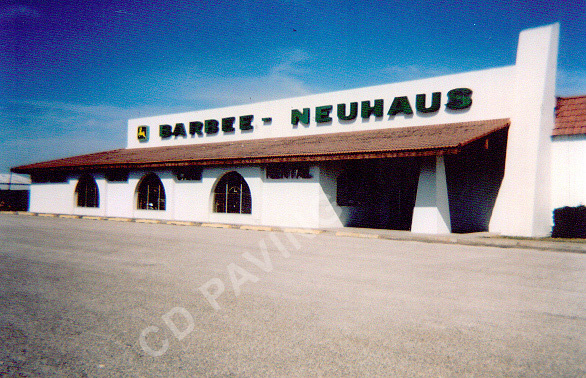 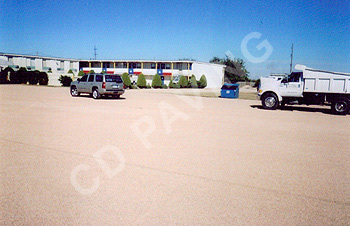 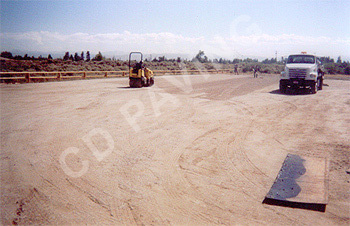 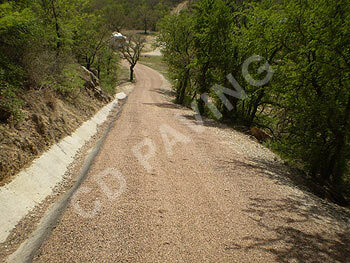 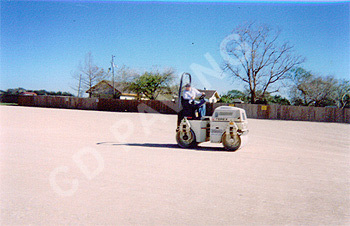 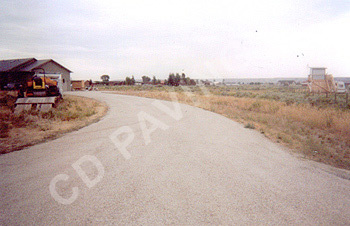 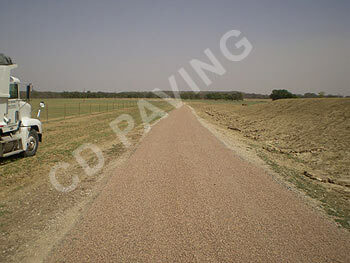 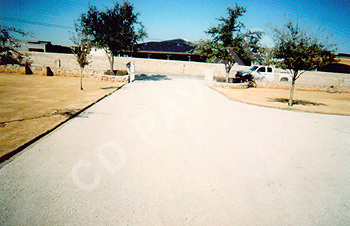 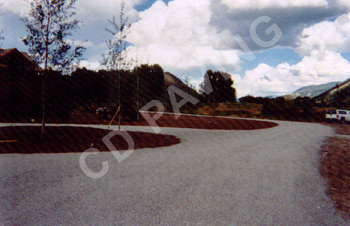 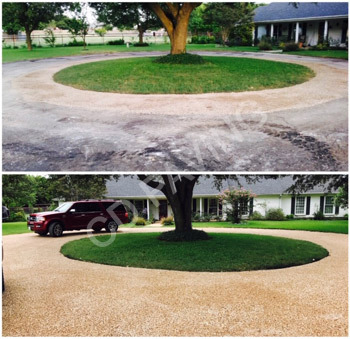 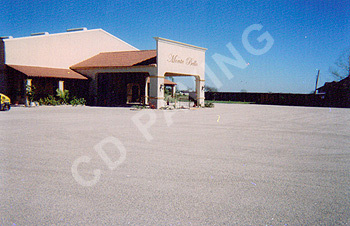 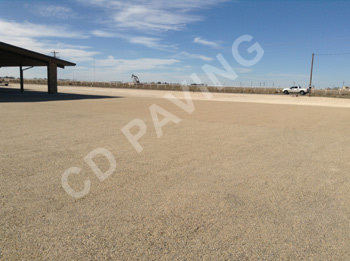 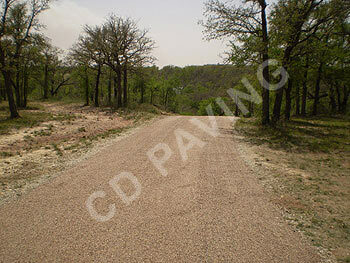 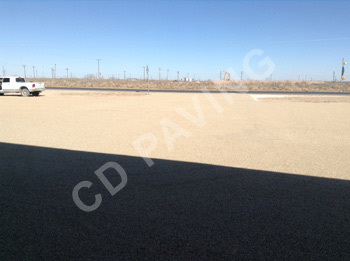 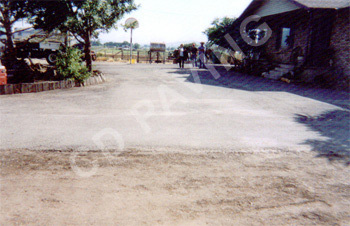 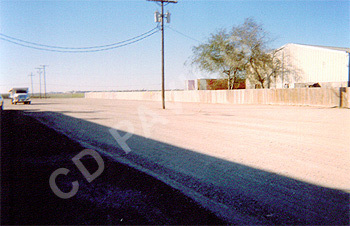 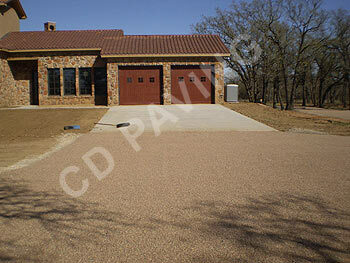 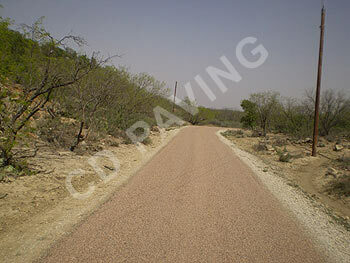 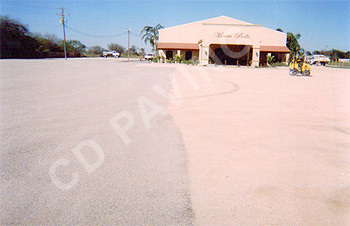 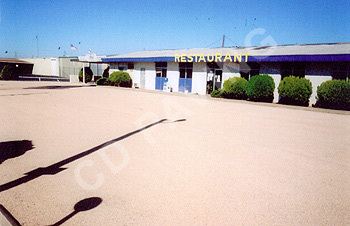 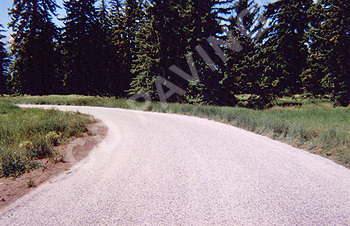 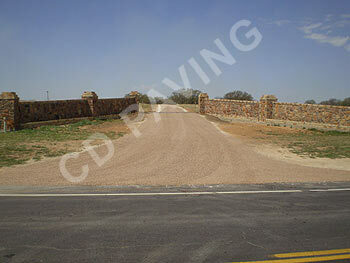 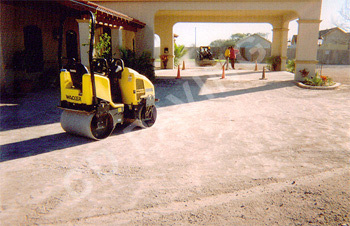 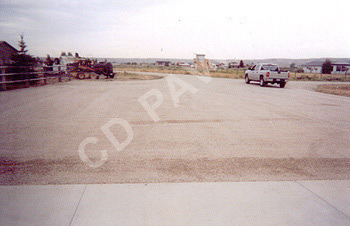 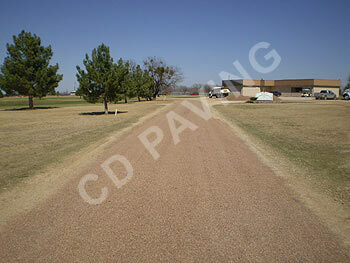 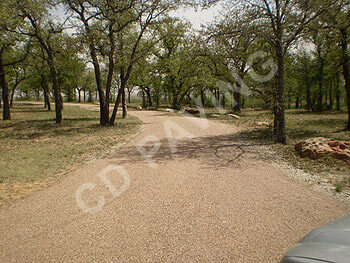 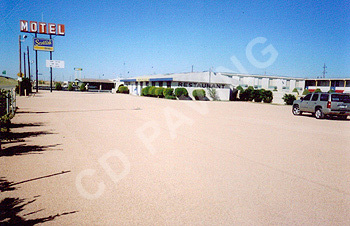 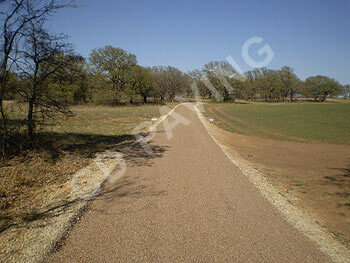 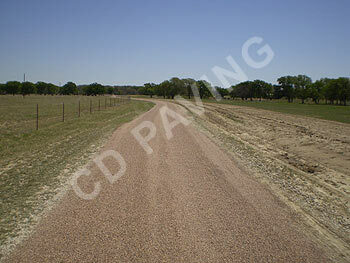 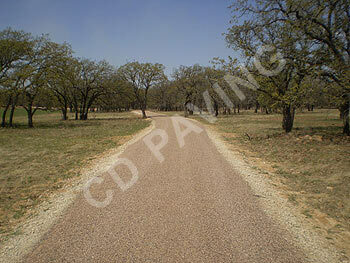 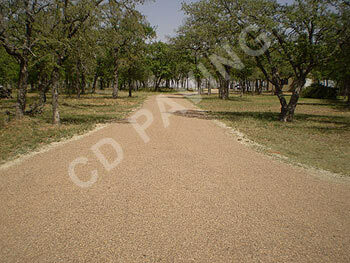 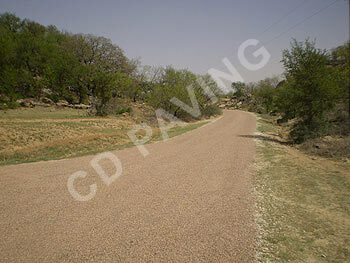 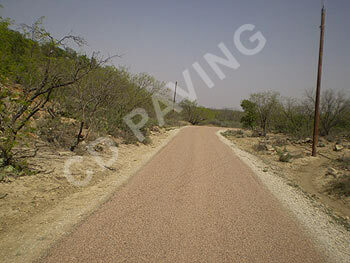 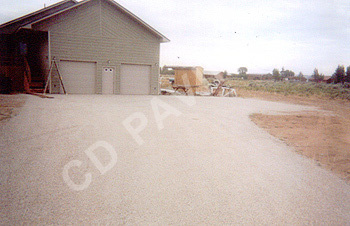 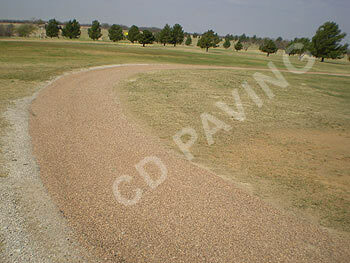 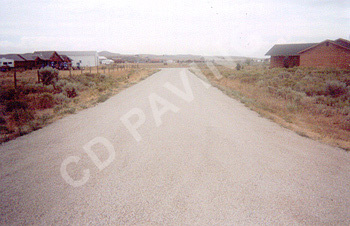 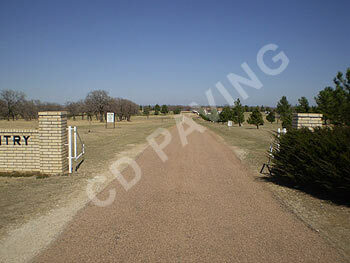 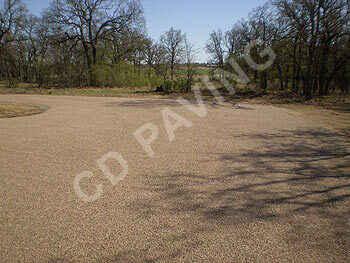 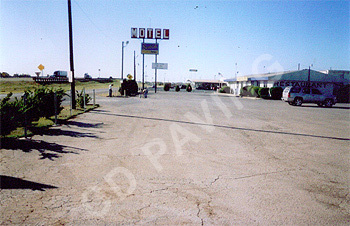 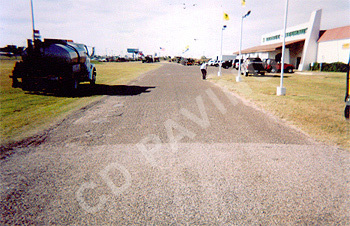 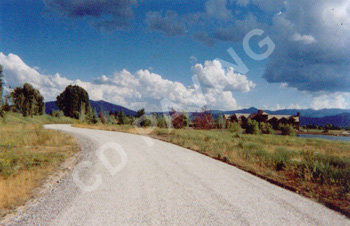 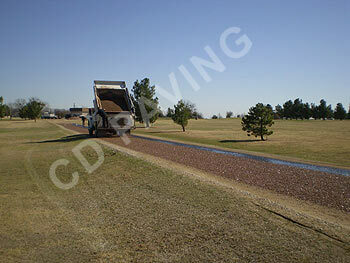 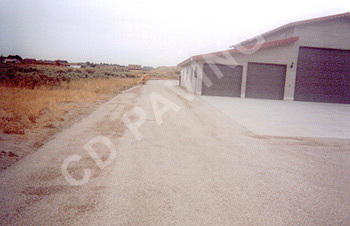 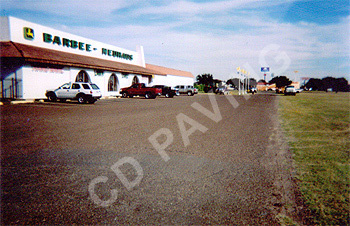 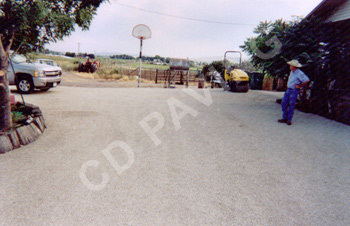 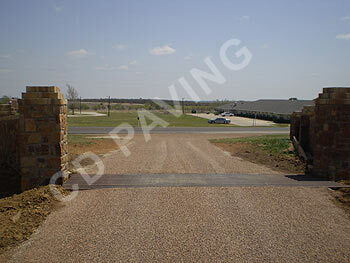 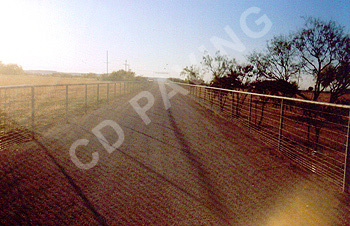 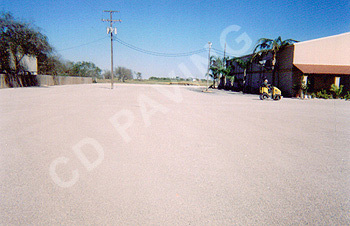 Tar & Chip Seal is a pavement that can be applied to a dirt or black top surfaces. 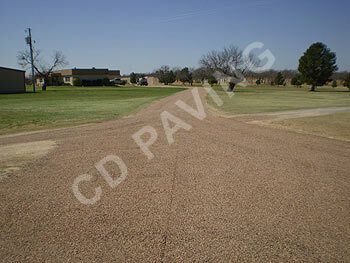 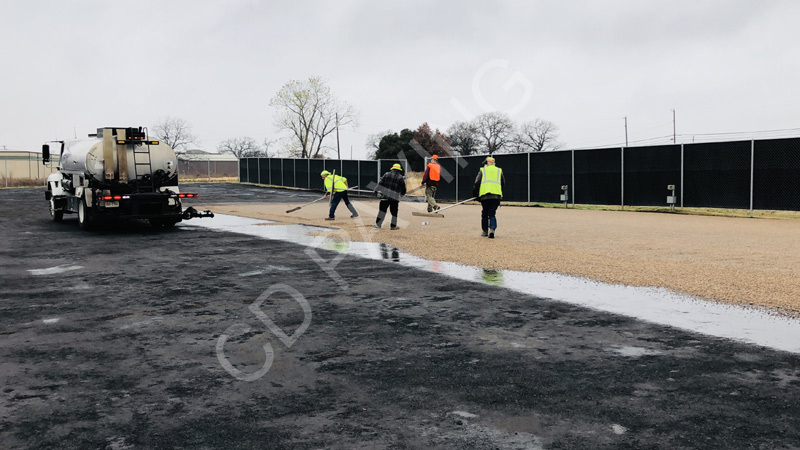 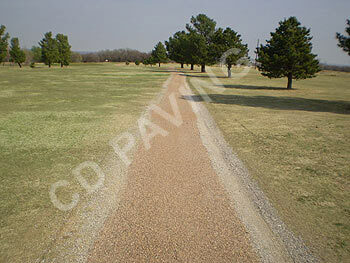 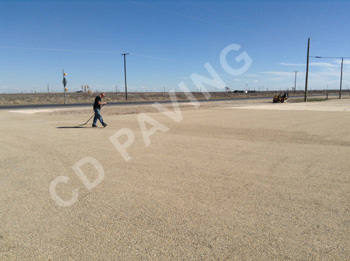 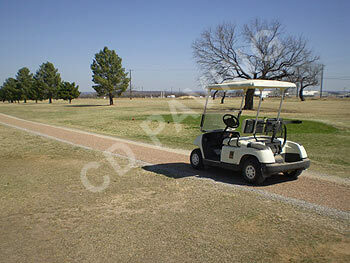 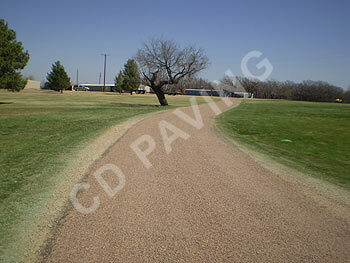 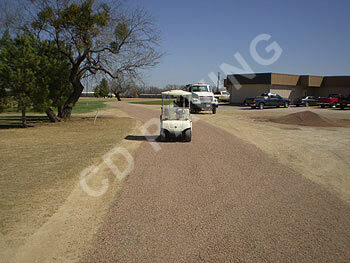 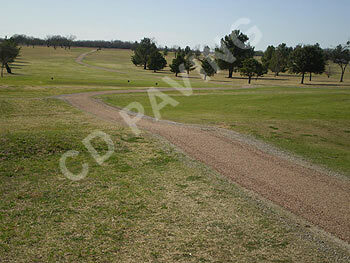 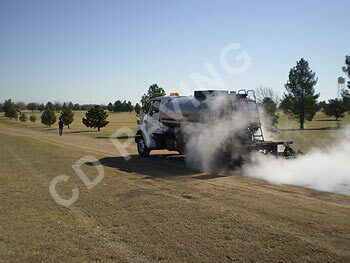 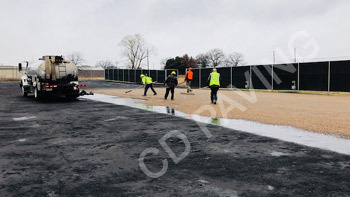 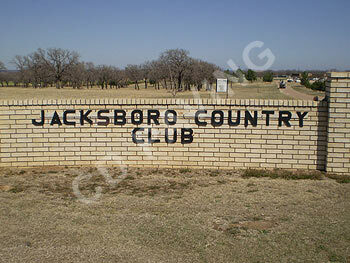 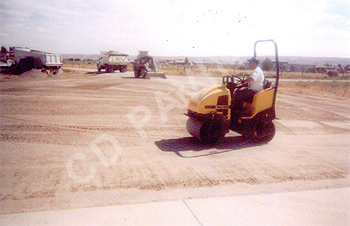 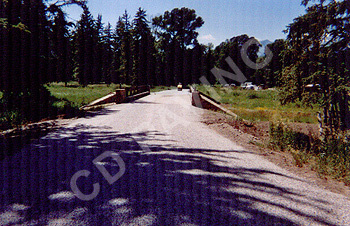 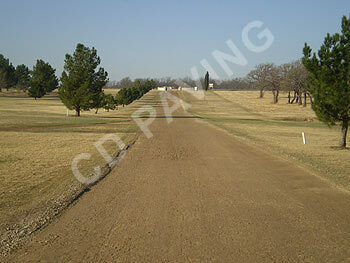 It is a coating of hot liquid asphalt followed by a layer of 3/8" chip rock then rolled to compaction. 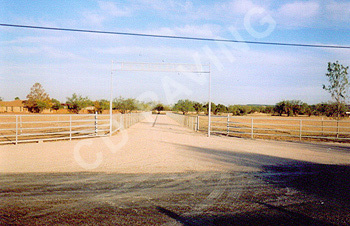 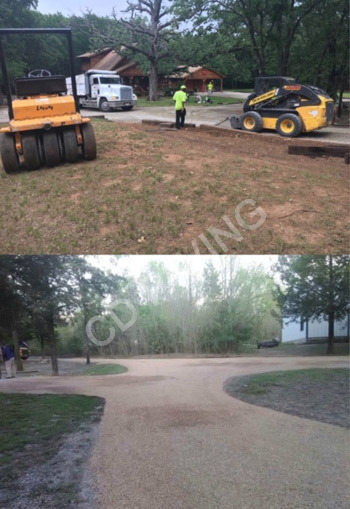 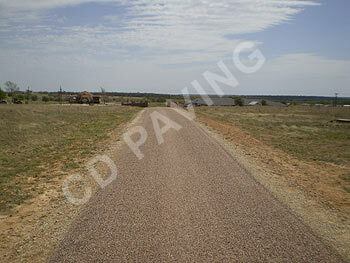 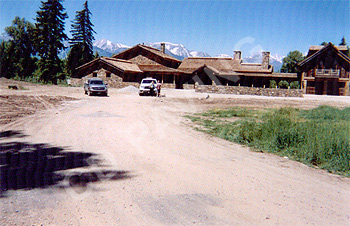 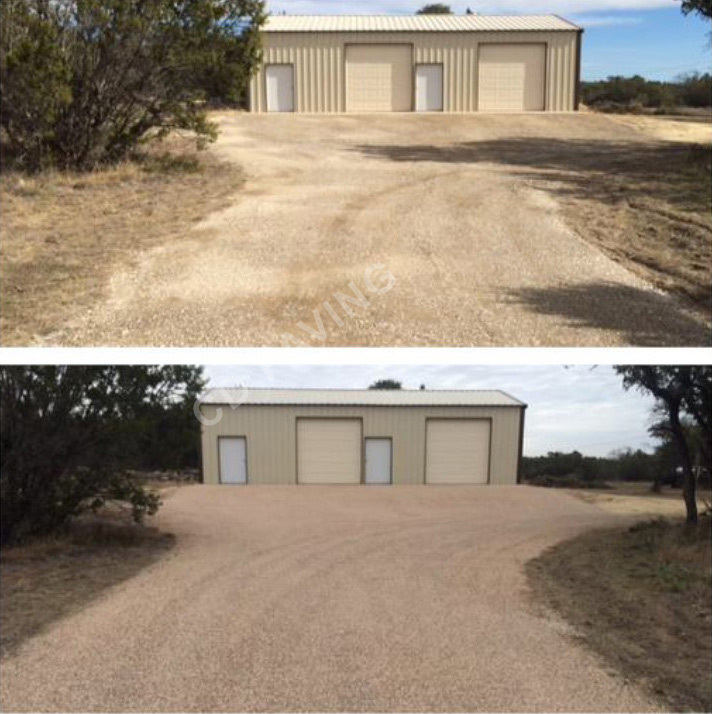 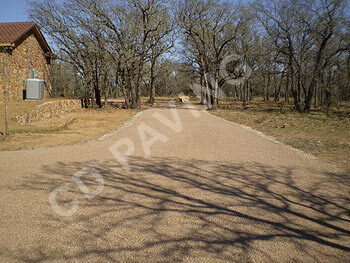 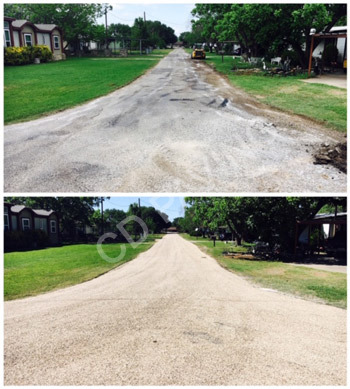 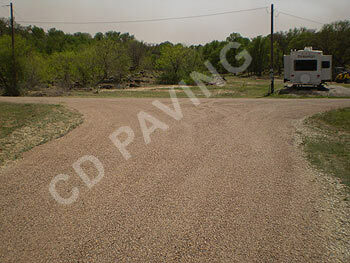 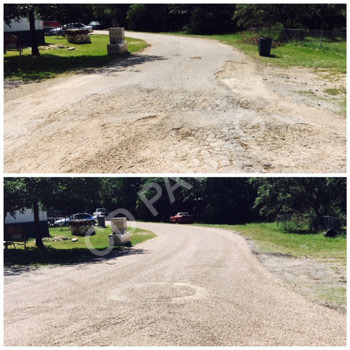 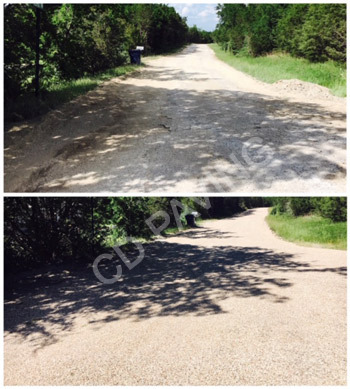 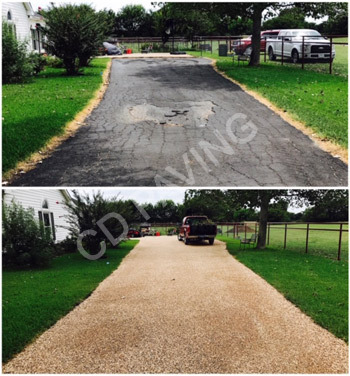 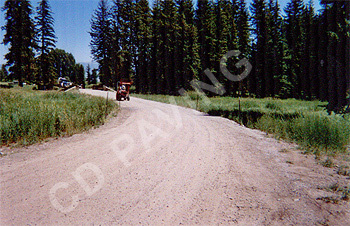 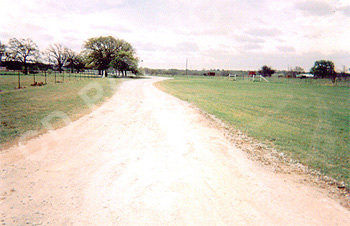 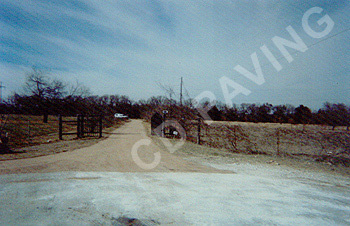 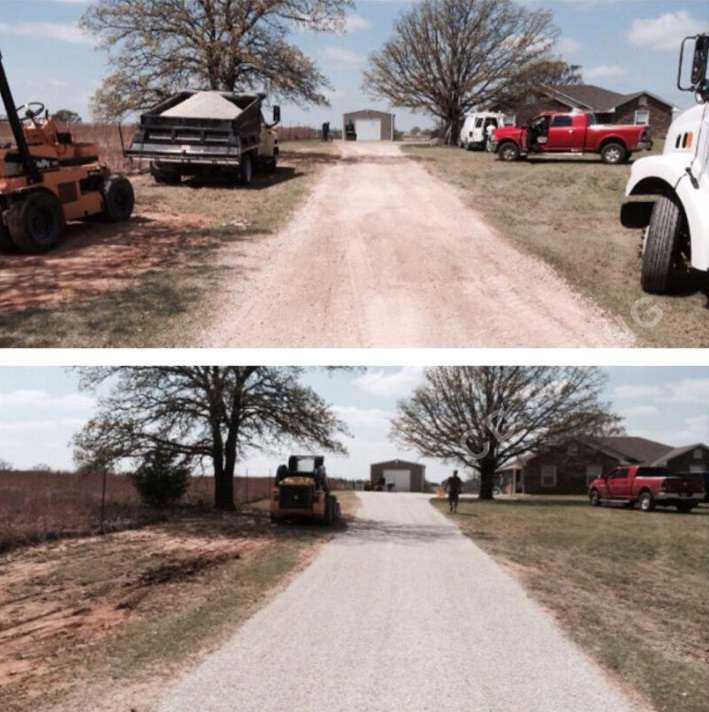 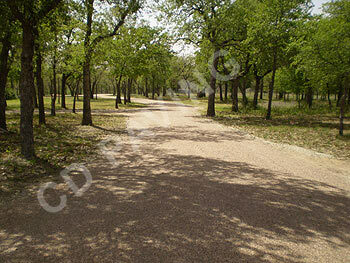 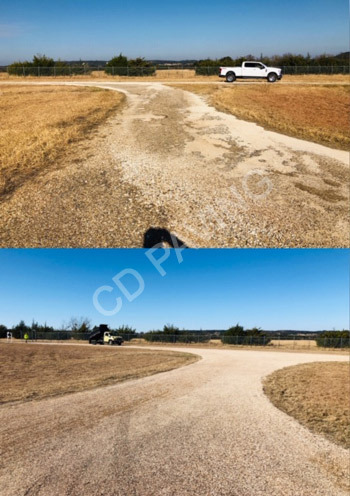 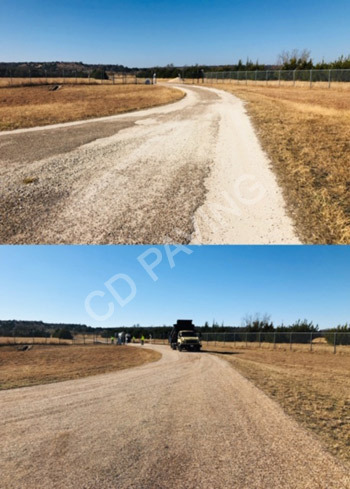 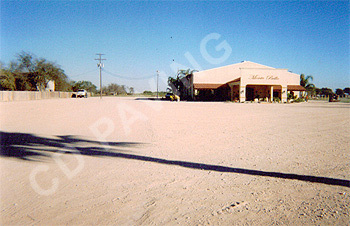 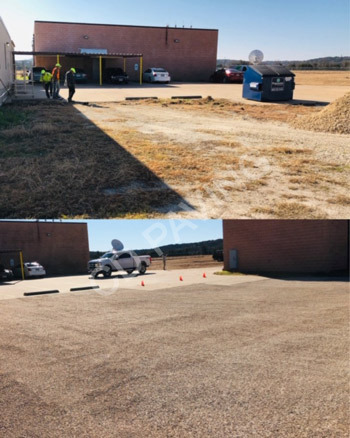 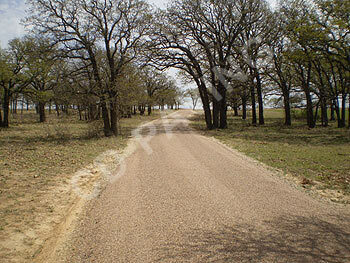 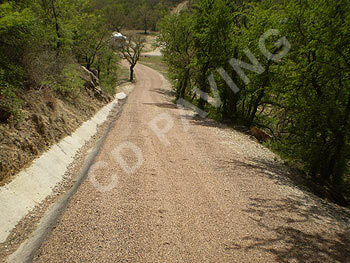 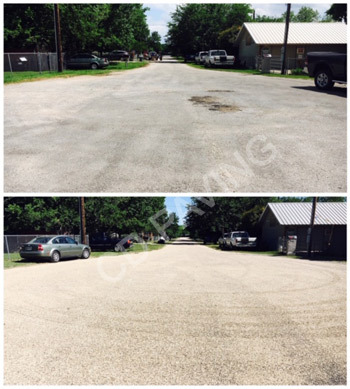 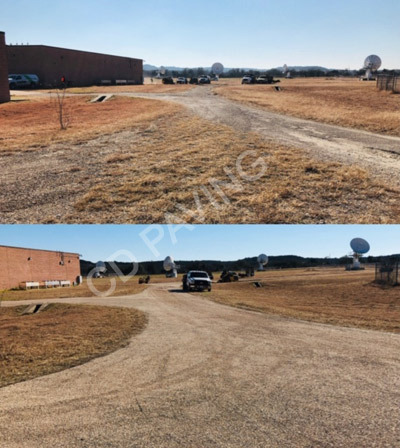 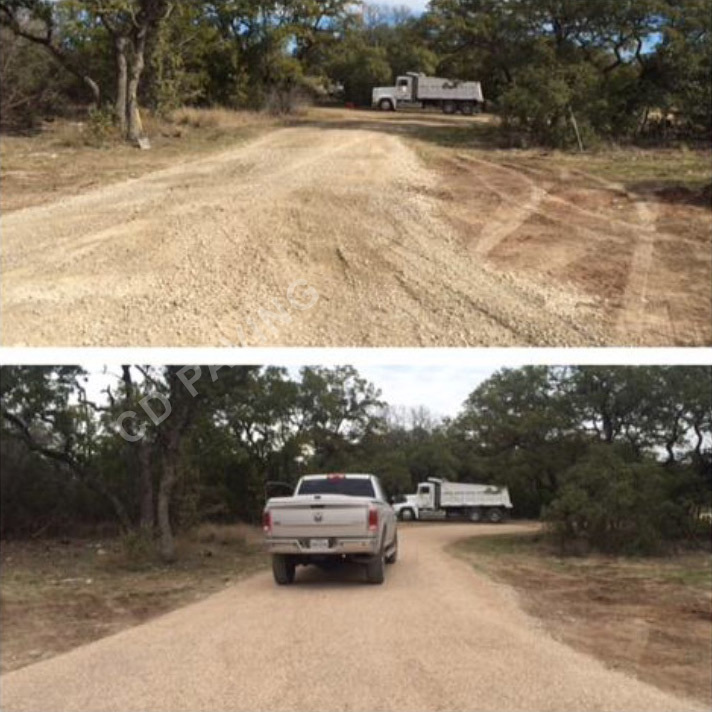 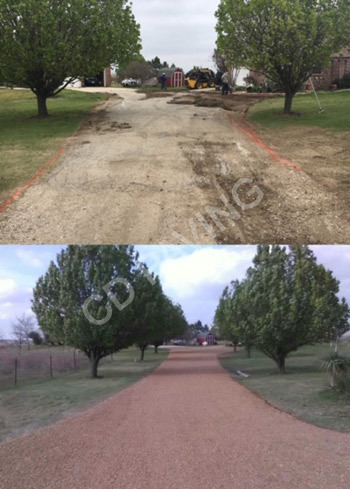 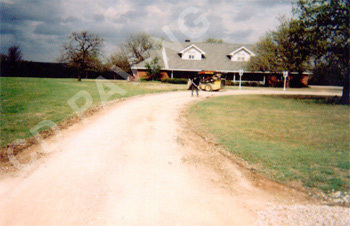 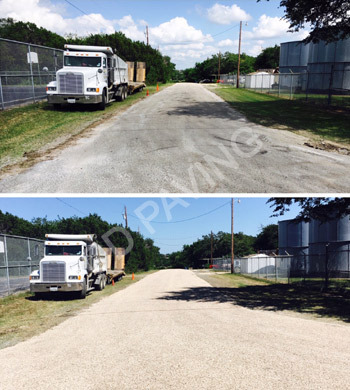 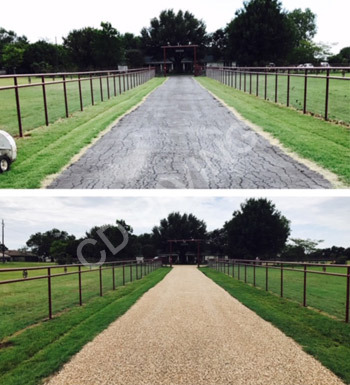 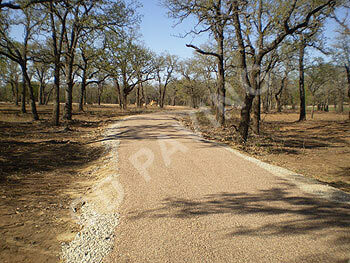 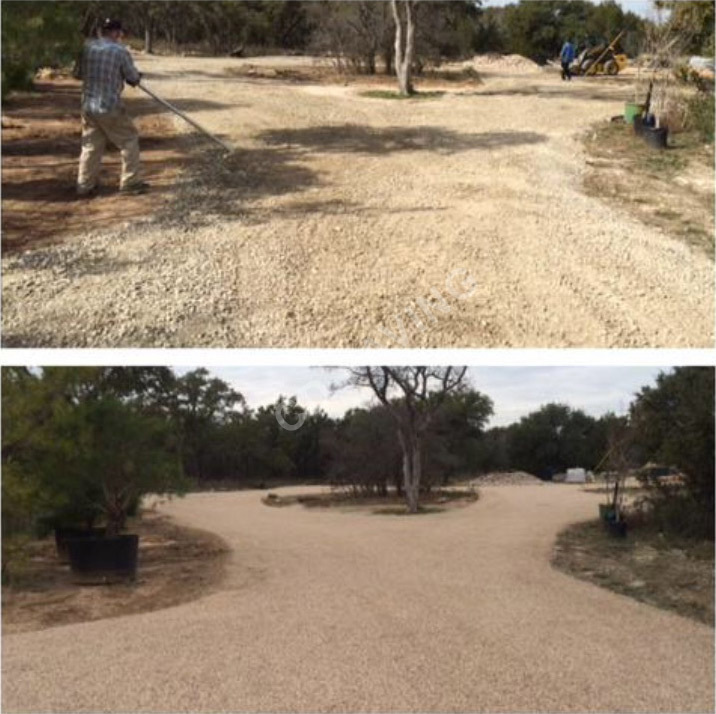 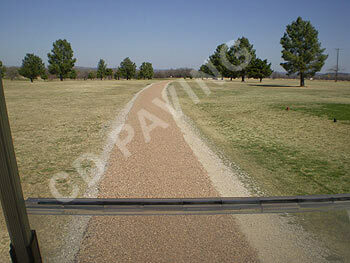 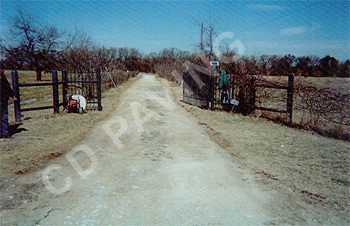 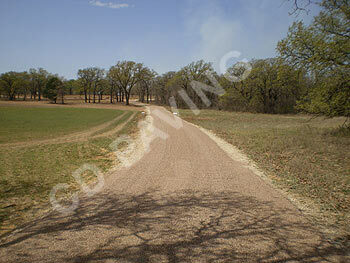 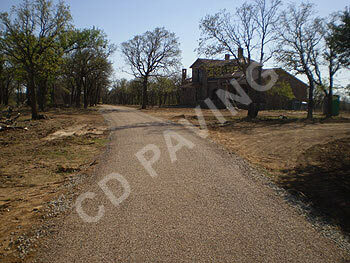 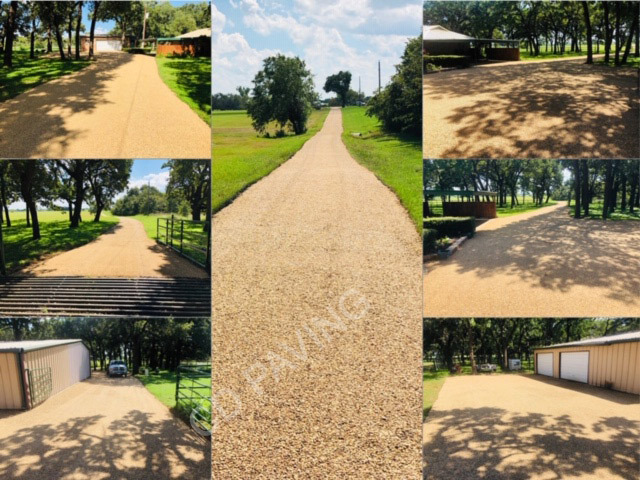 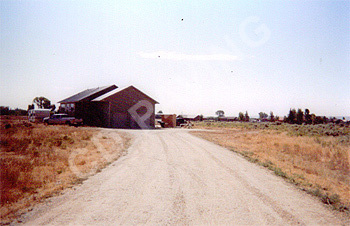 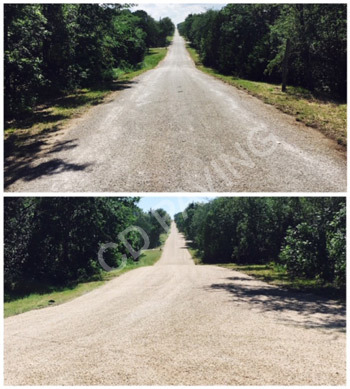 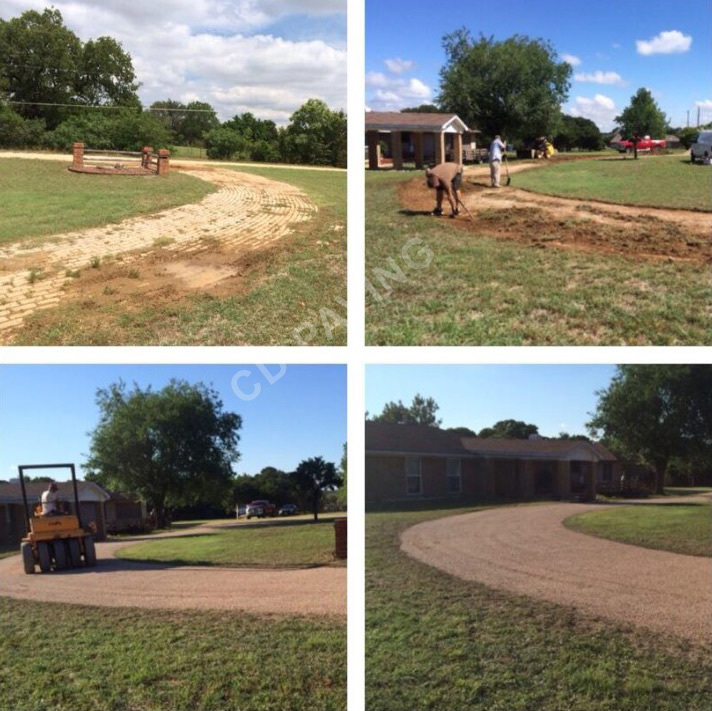 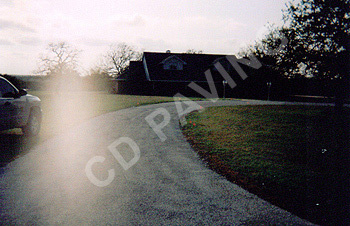 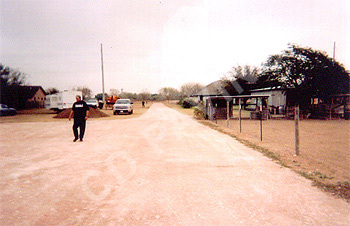 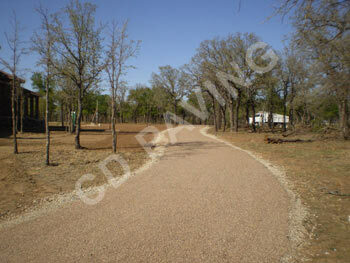 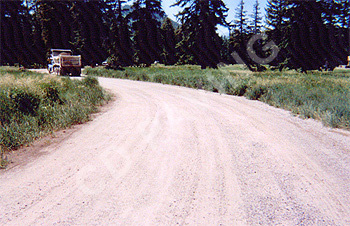 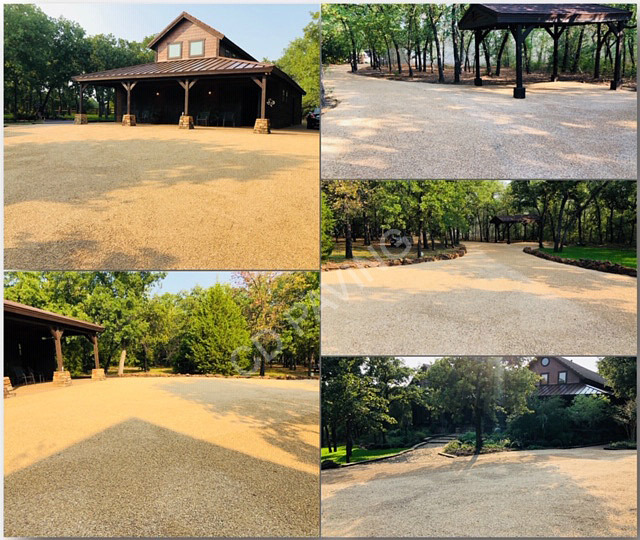 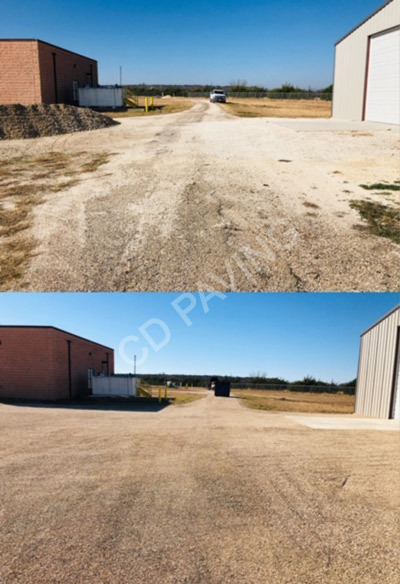 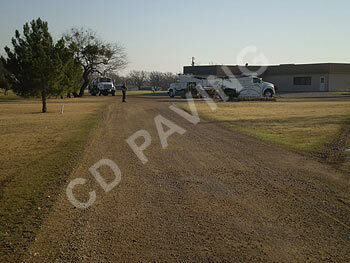 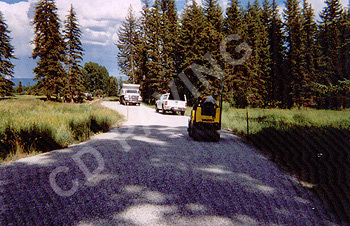 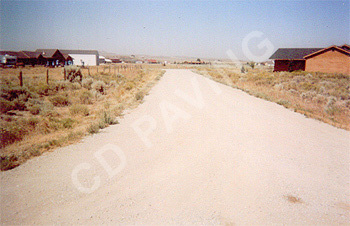 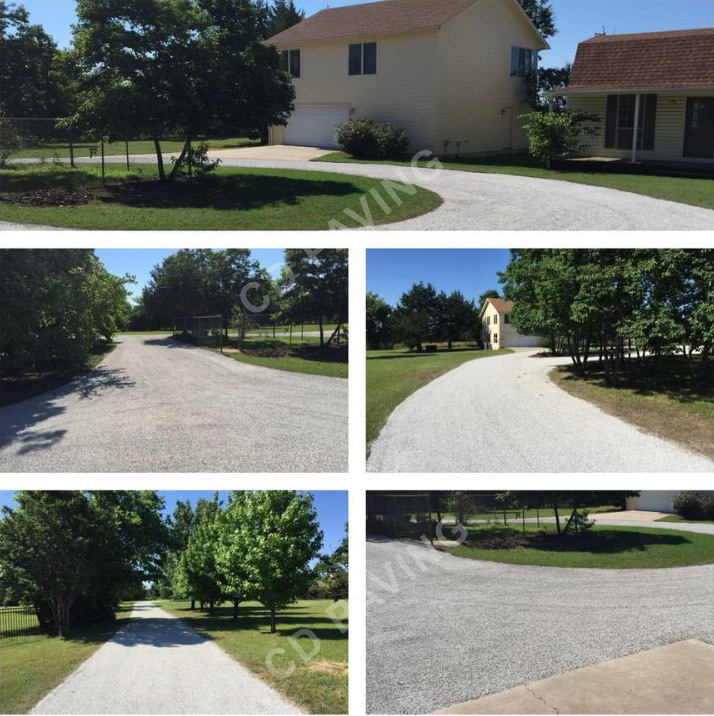 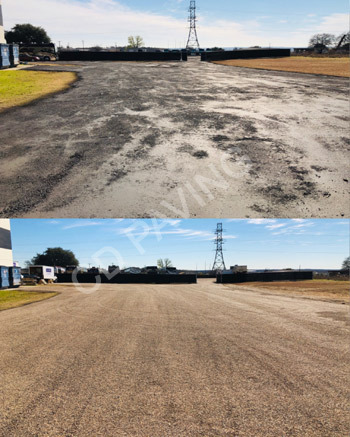 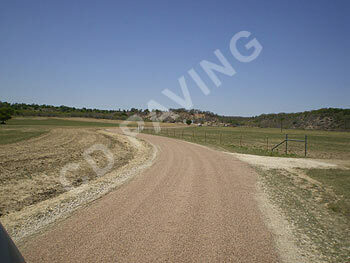 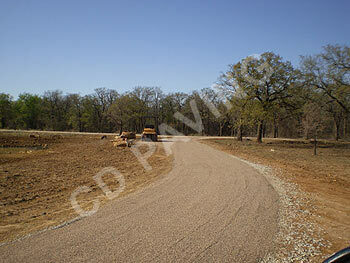 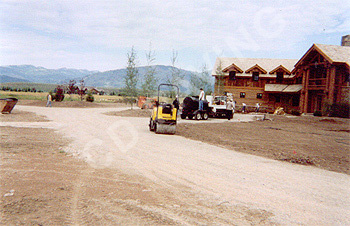 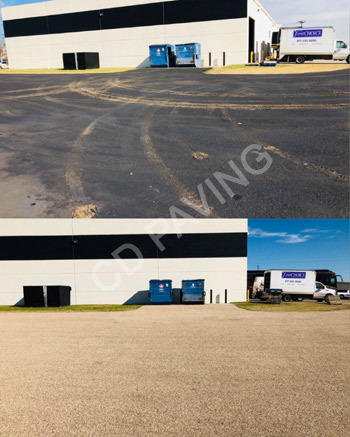 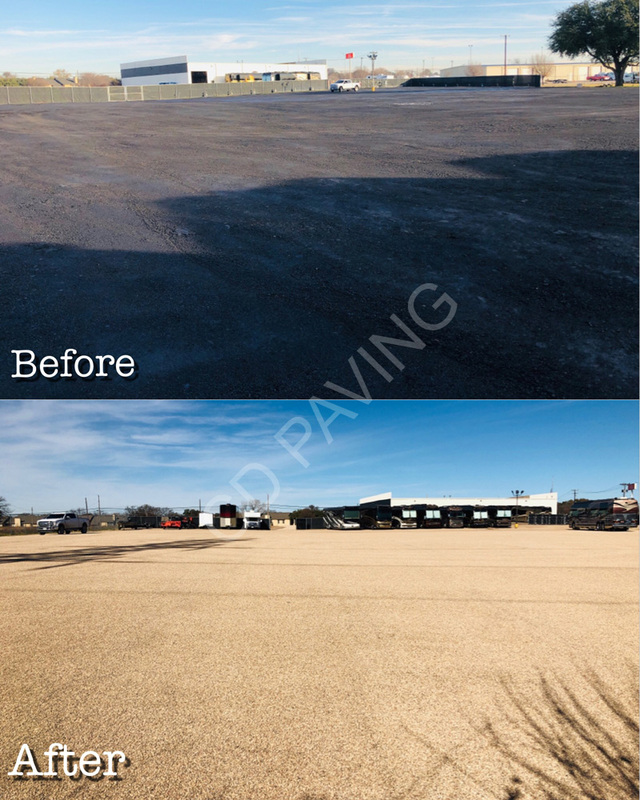 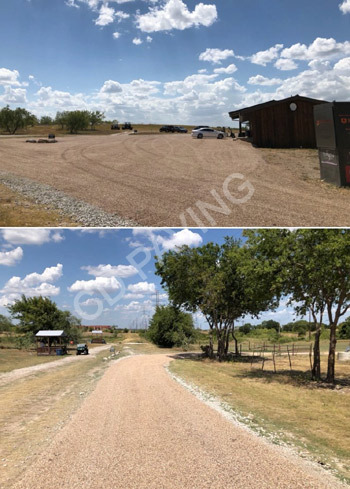 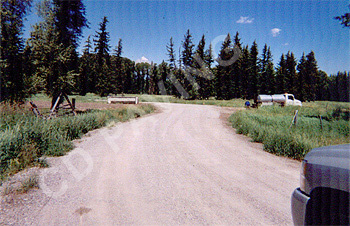 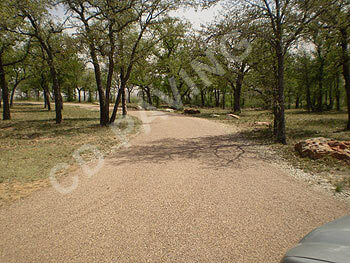 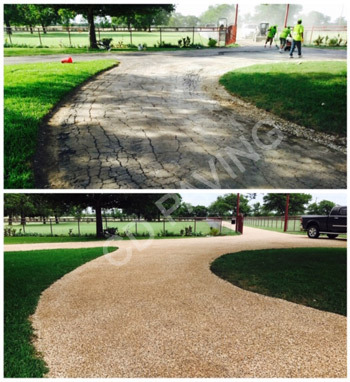 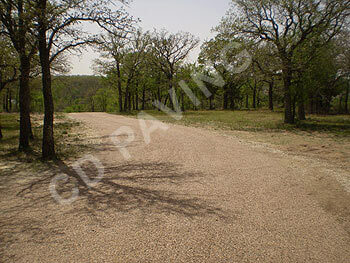 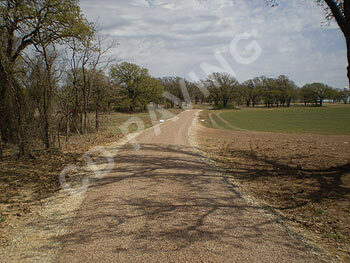 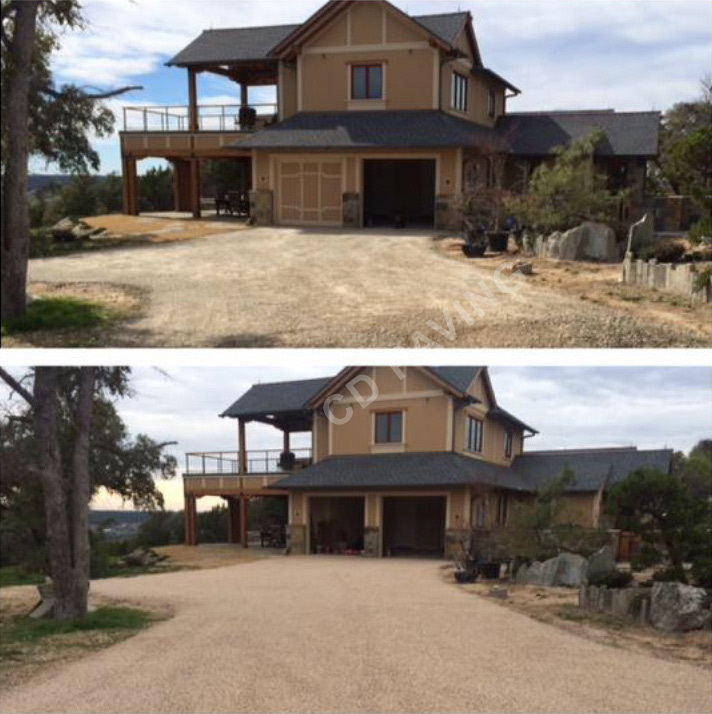 When a new Tar & Chip job is completed, it looks like a gravel driveway. 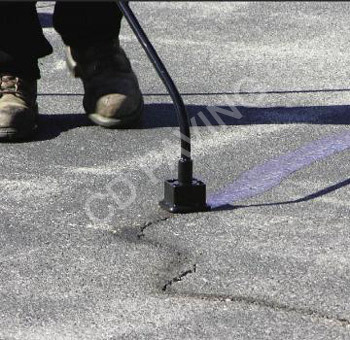 But the rock that comes in contact with the Tar is locked in tight. 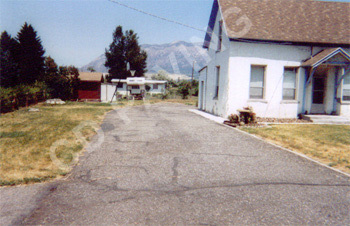 The tar and the rock become one form of pavement. 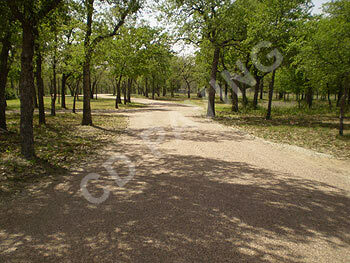 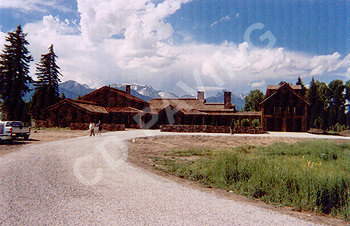 It has a very clean, natural country look. 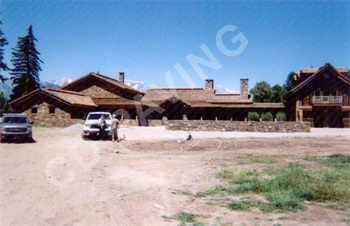 It has a lot of curb appeal and is strong. 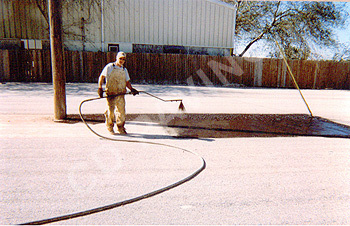 Plus it won't draw in heat like Black Top. 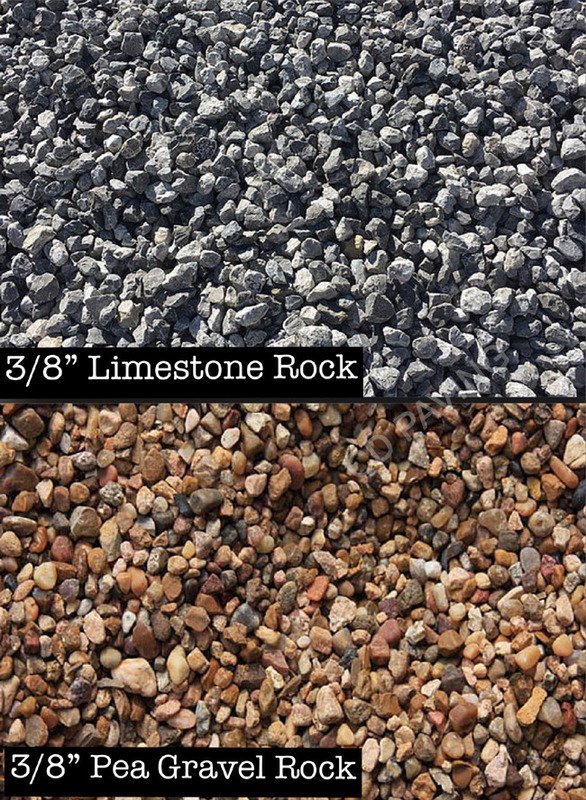 What About the Loose Rock On Top? 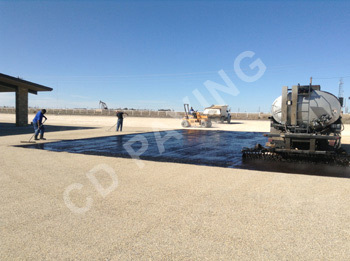 When a new Tar & Chip seal job is first installed, there will be some loose surface rocks on top. 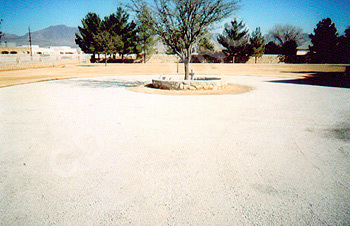 But that's just the rock lying on top of the rock that is already locked in the tar. 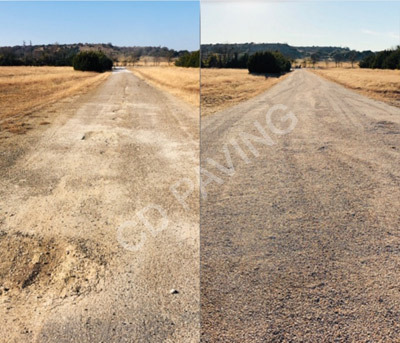 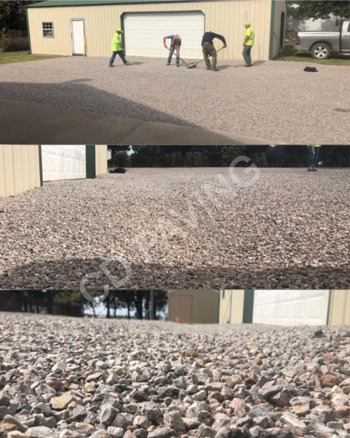 But when you start driving on your new road and the temperature warms up all of the loose surface rocks on top will seal in with the rest of the job. 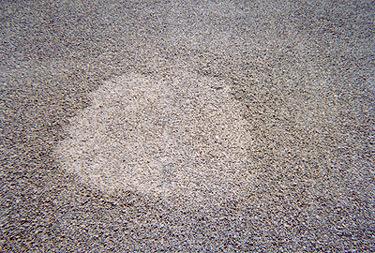 That's the nature of Tar & Chip seal. 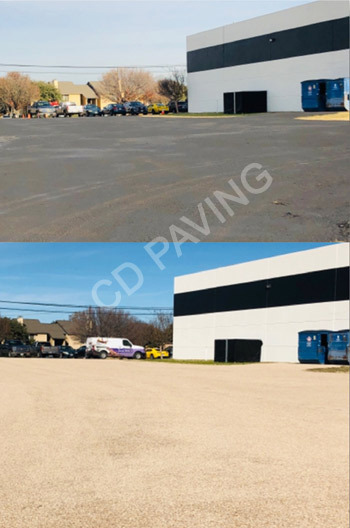 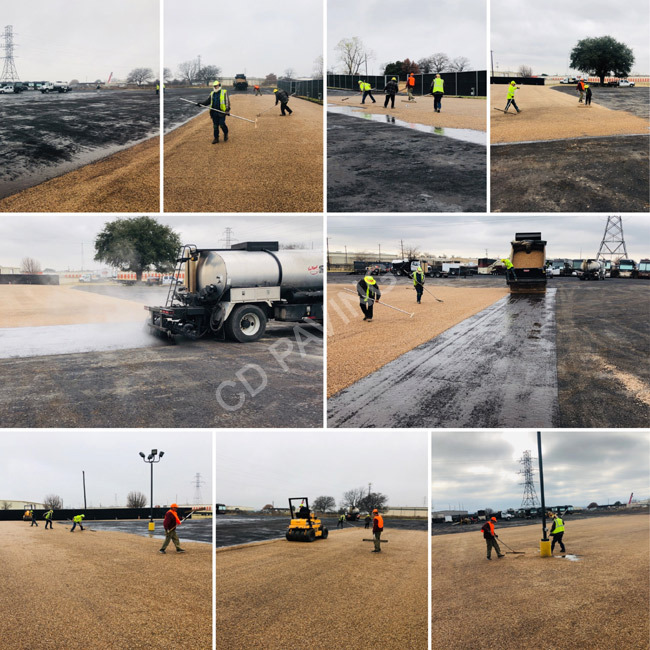 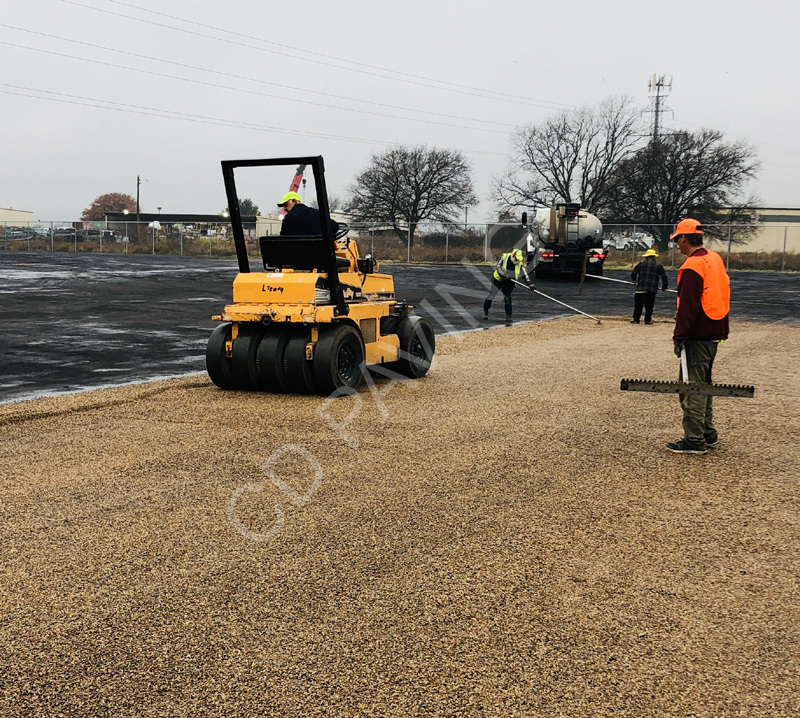 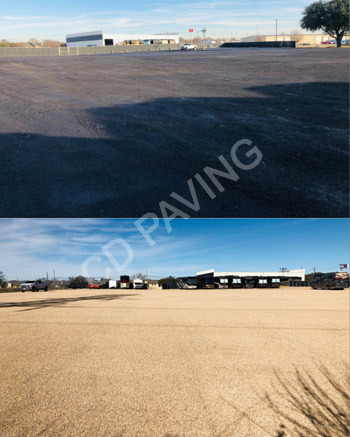 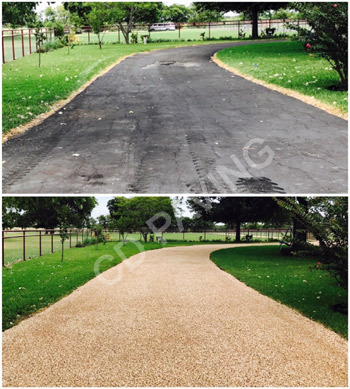 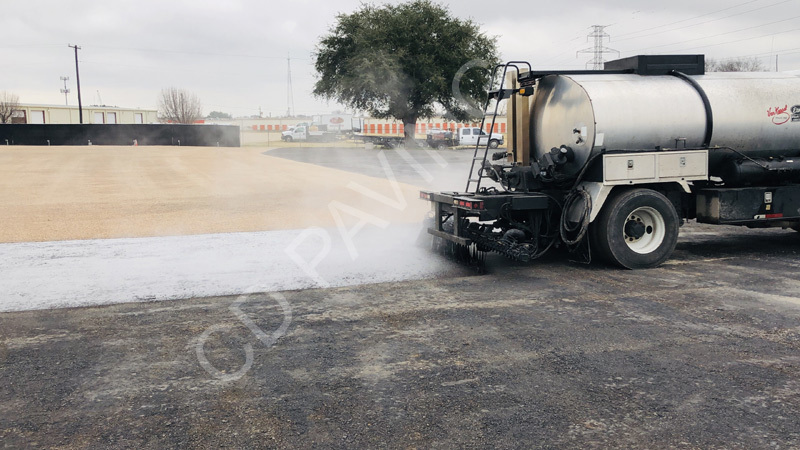 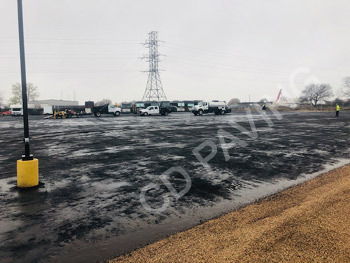 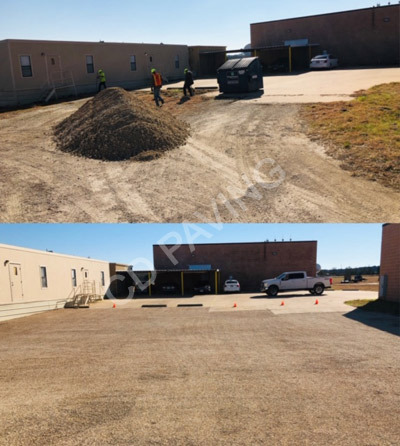 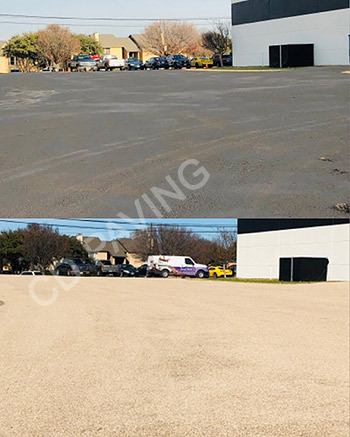 As with rising cost of oil, fuel and asphalt tar, all pavements whether it is black top, concrete or chip seal grow higher every year as well. 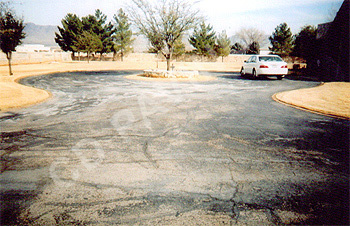 But Tar & Chip seal is about 30% to 40% less than what black top costs to get paved. 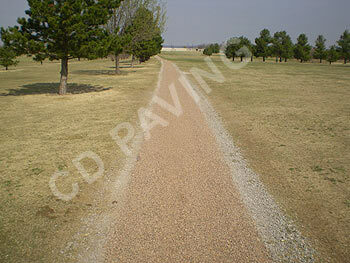 Plus it costs less to keep because it is maintenance free. 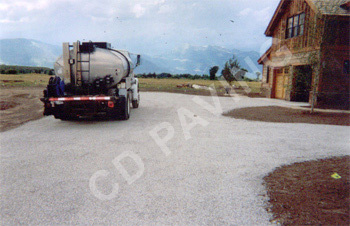 Concrete is the most expensive of the three pavements. 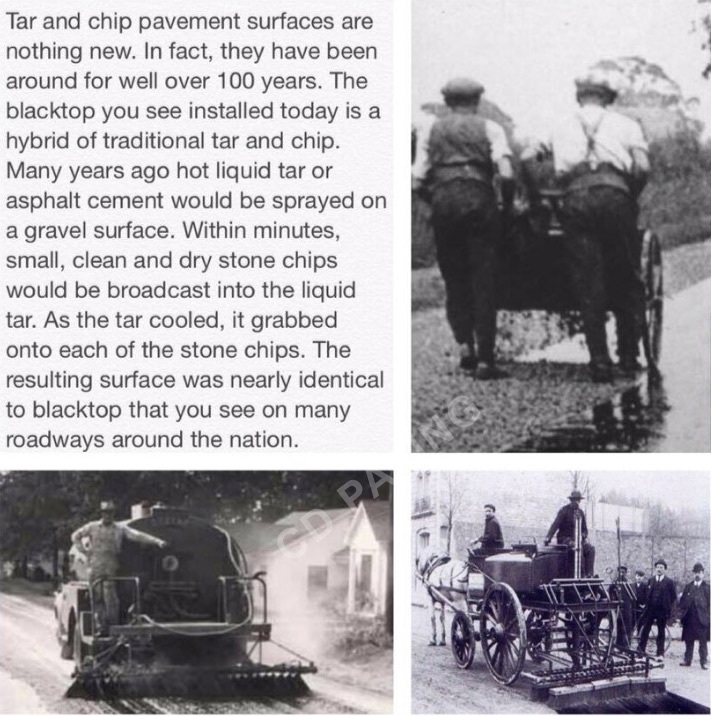 How Will Tar & Chip Seal Hold Up Against A Snow Plow? 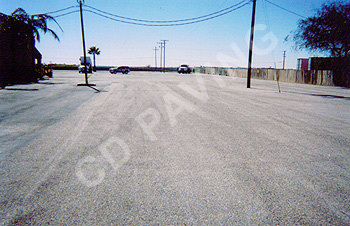 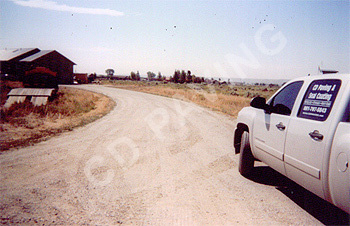 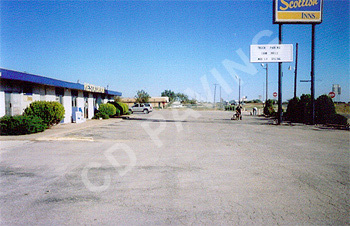 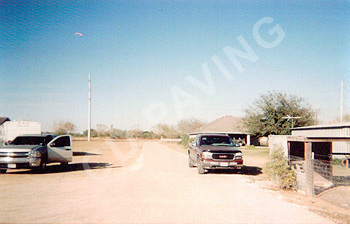 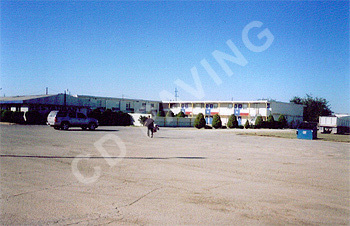 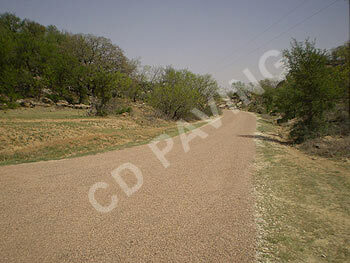 You must understand that Tar & Chip Seal is a pavement that is used in many northern states (almost all). 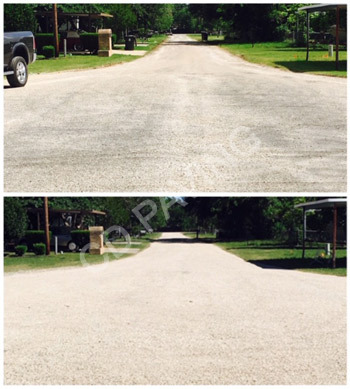 On driveways, parking lots, county roads and state roads. 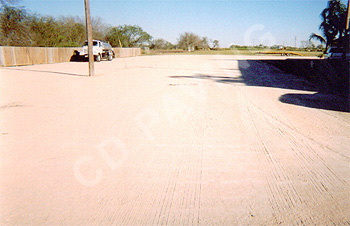 All which must be shoveled, plowed or blowed when it snows. 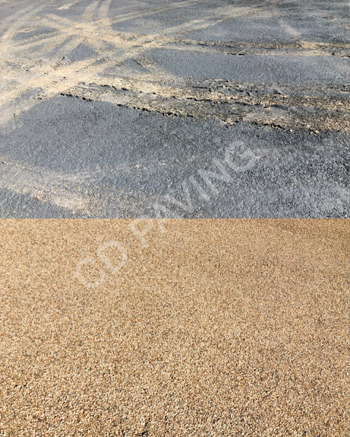 You can use all three on Tar & Chip Seal. 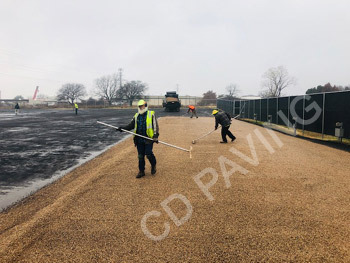 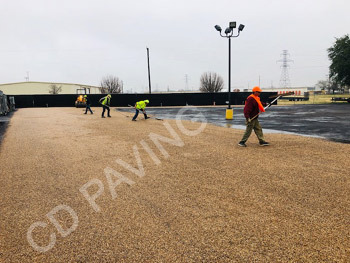 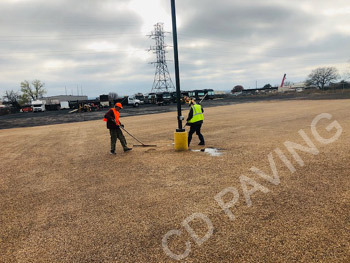 Whether you are applying your chip seal to a base surface or old pavement, when it comes time to plow all you do is lift up on your plow about half inch of the ground, then plow. 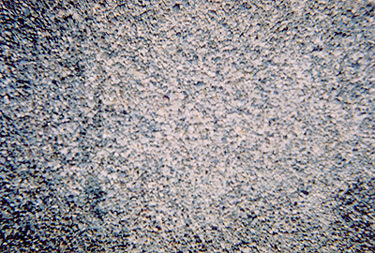 Chip seal is strong. 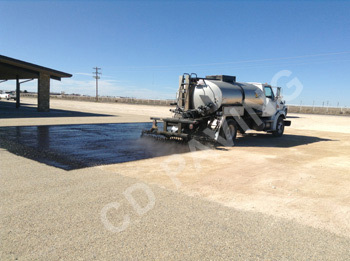 So Why Doesn't Everyone Use Tar & Chip Seal? 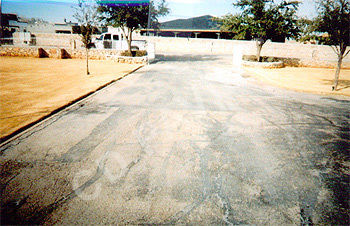 The number one problem with Tar & Chip Seal is hardly no paving contractors still install them. 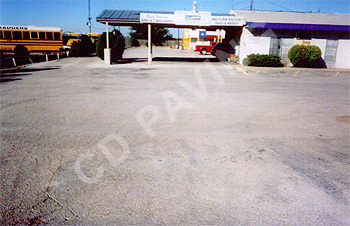 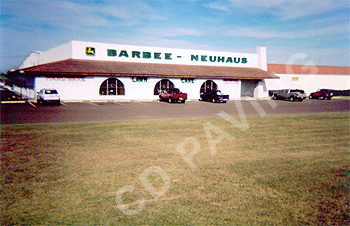 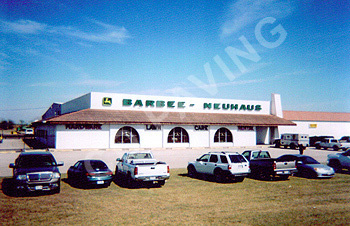 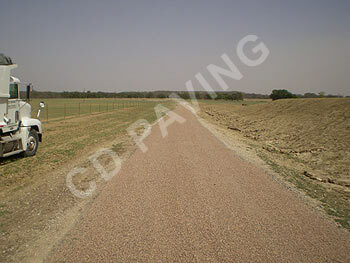 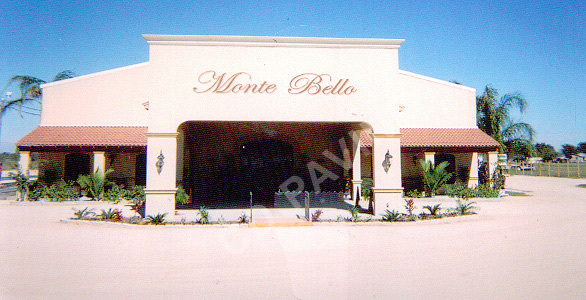 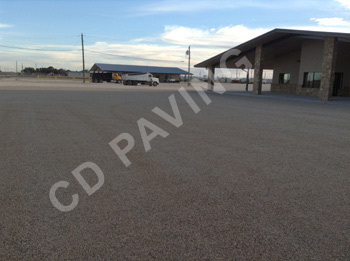 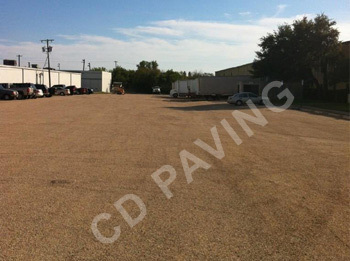 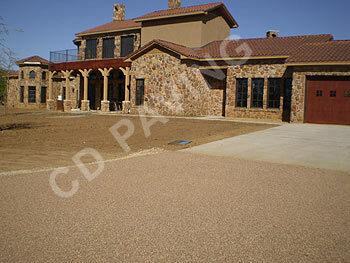 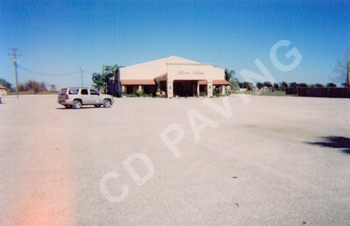 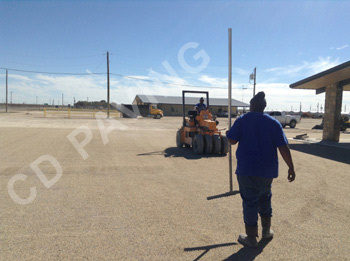 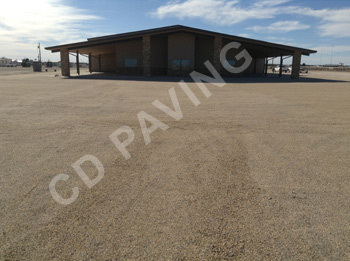 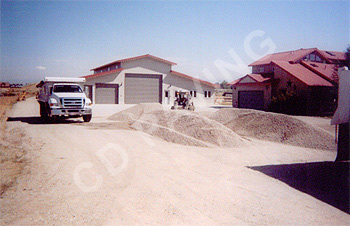 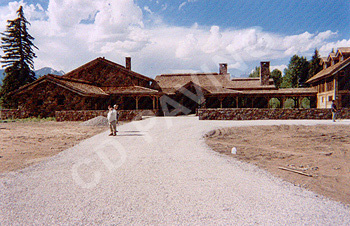 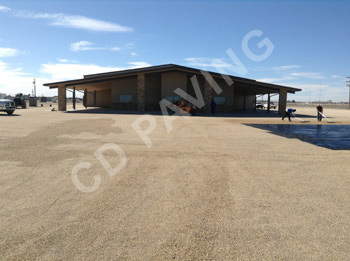 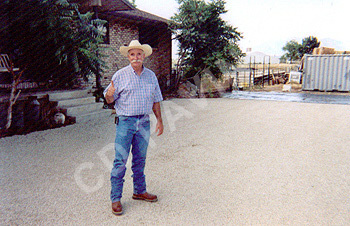 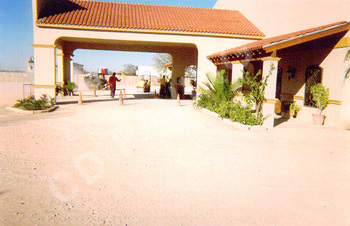 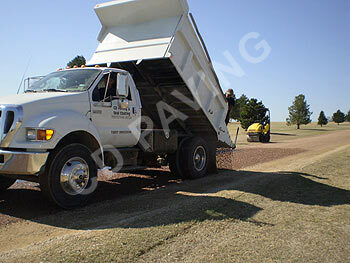 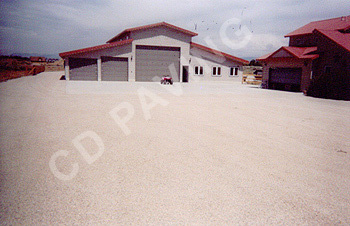 You will have trouble finding a paving contractor that still installs them. 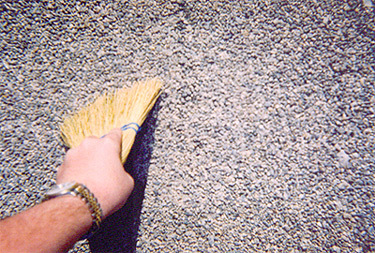 You will have trouble finding a contractor in the phonebook who even knows what Tar & Chip Seal is let alone can install it. 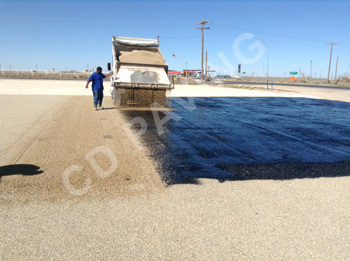 Here is why; Using tar as a binder requires warm temperatures for the tar to remain tacky. 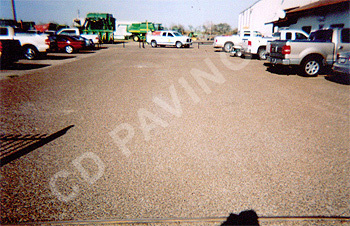 This limits the paving season during which CHIP SEAL ROADS can be laid. 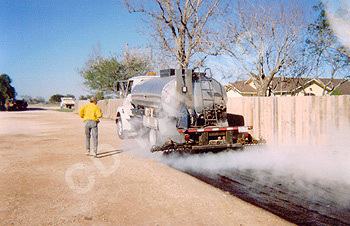 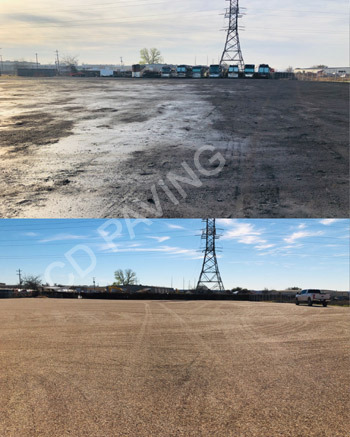 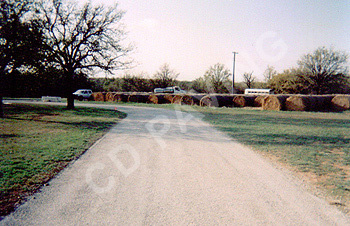 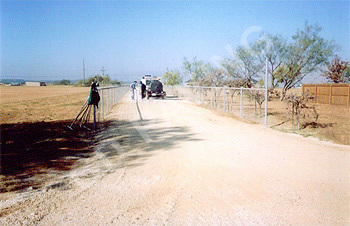 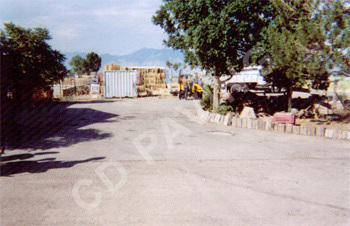 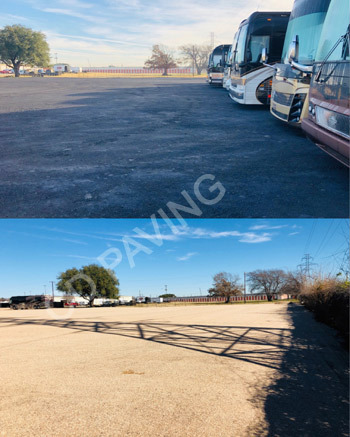 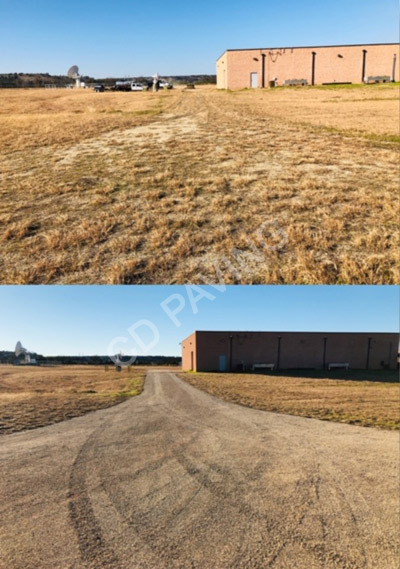 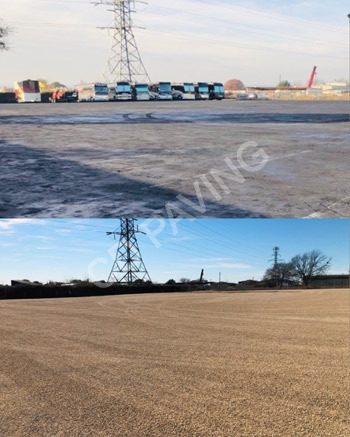 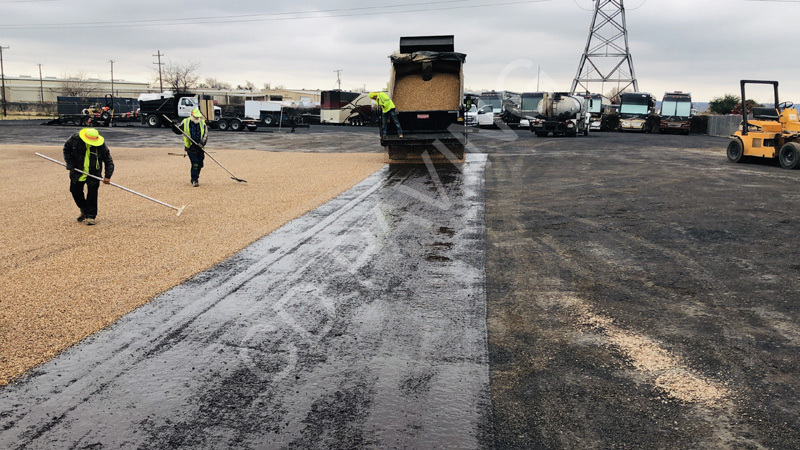 Asphalt manufacturers realized several decades ago that by mixing road materials at their plants rather than onsite they could extend the paving season. 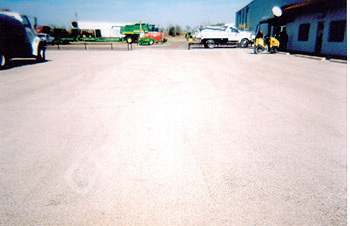 Since they could control the temperatures within their plants. 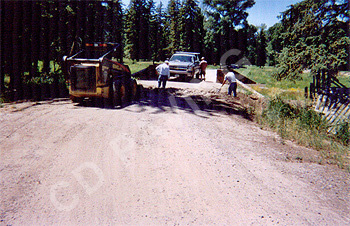 Today that is what paving companies do. 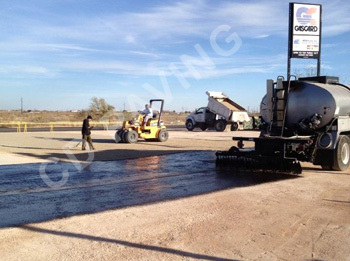 They mix asphalt at a hot mix plant and transport it to the job site. 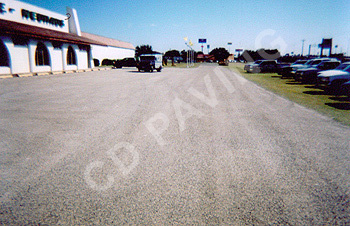 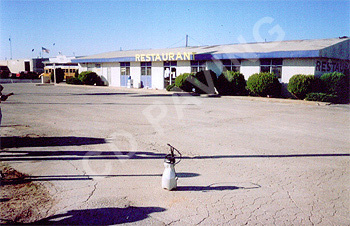 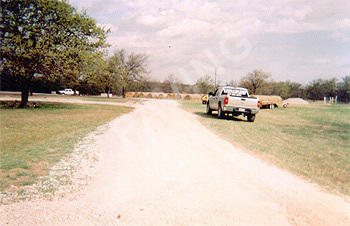 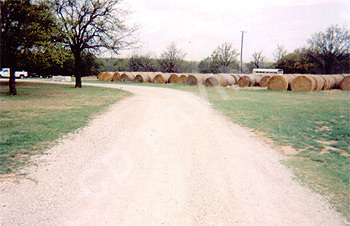 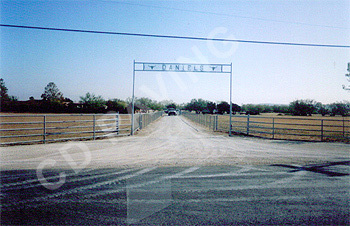 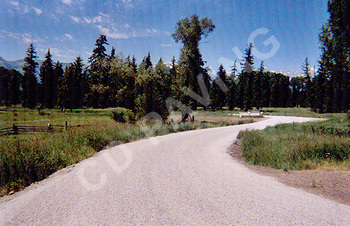 But chip seal was the original way they did all roads, driveways, streets and parking lots. 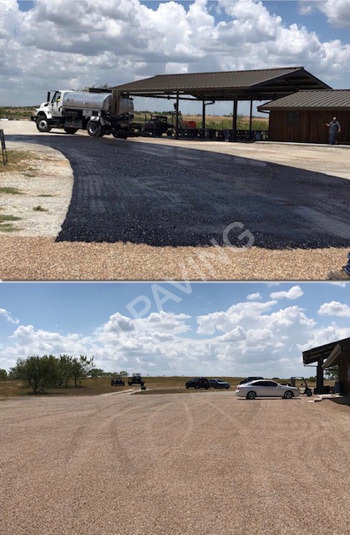 So Who Is Using Tar & Chip Seal Now? 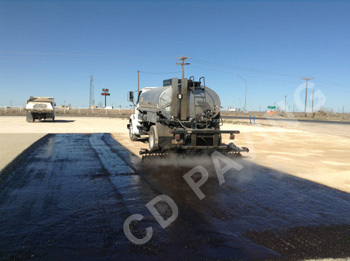 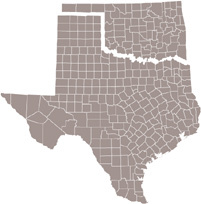 The industry that is using Tar & Chip Seal regularly is your county, state and city. 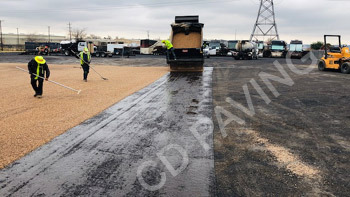 Mostly all of your county and state roads have all been chip sealed. 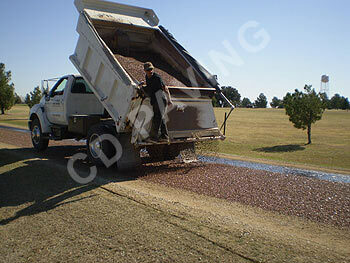 And with the rising cost of hot mix black top, a lot of cities are using chip seal on their city streets. 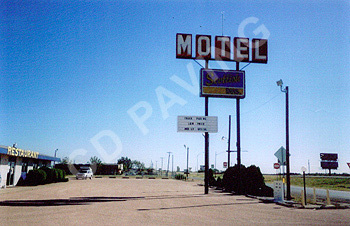 But the average person may not know that. 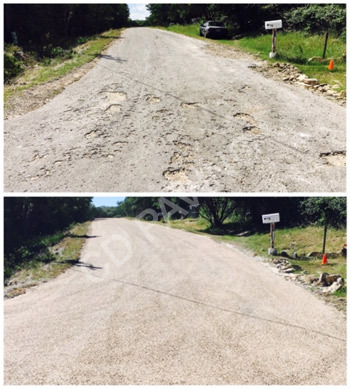 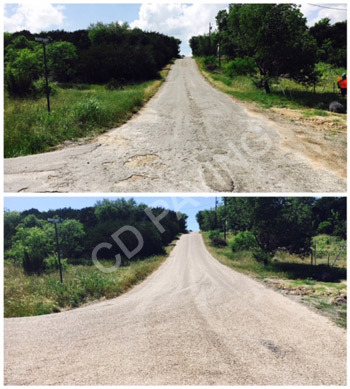 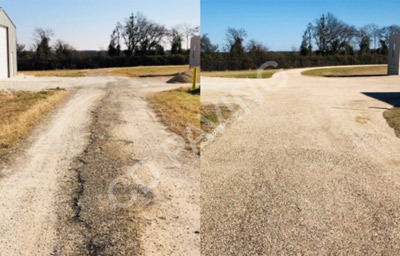 When a county, state or city road is chip sealed it only takes 6 to 8 months for all of the top surface rocks to seal in because of the high volume of traffic it gets making it look very much like older cured black top road. 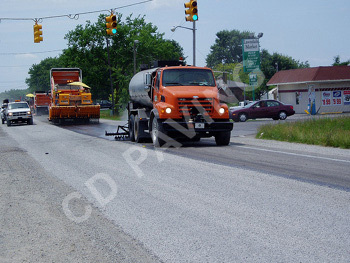 We are not saying that all county, state and city roads and streets are chip sealed but most of them are. 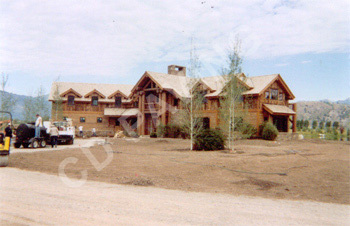 Not satisfied with our info? 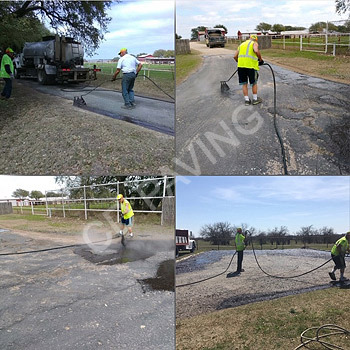 Click to see what other Tar & Chip experts say!